Adapting Richard Wright’s 1940 novel, Native Son, to the big screen in the 21st-century was always going to be a monumental feat. The controversial story had already been actualized on the big screen twice—once in a 1951 film starring Wright himself, and then again in 1986 for PBS starring Oprah Winfrey. For his feature film debut, conceptual artist-turned-director Rashid Johnson thrusts Wright’s narrative into the modern day, bringing with it all of society’s failings surrounding race, class, and privilege. 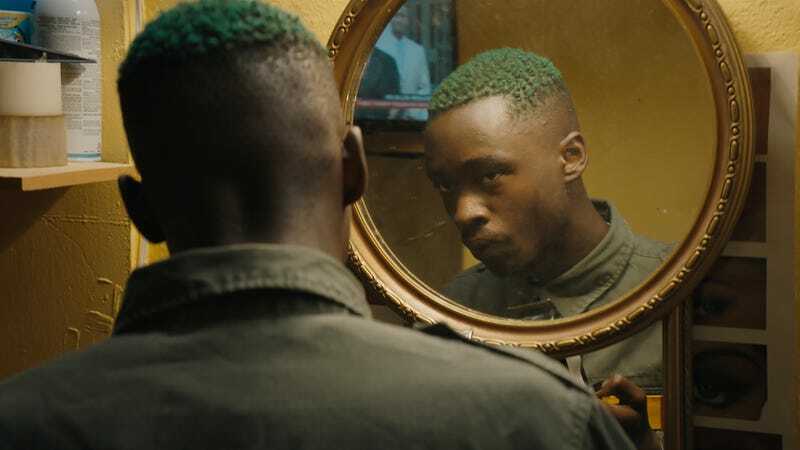 Using Wright as a guide along with Pulitzer Prize winner Suzan-Lori Parks’ screenplay, Johnson invites us into Bigger Thomas’ (Moonlight standout Ashton Sanders) world. Separated into three parts—Fate, Fear, and Flight—the film opens with Bigger’s voice-over. Arrogant and peculiar, Bigger is a lanky and quiet young black man. His green hair sits in sharp contrast to his shea butter-slathered dark skin. Bigger seems aloof, and he has an aura of superiority, though he still lives in his widowed mother’s (Sanaa Lathan) tiny apartment along with his younger siblings. Set in present-day Chicago, a city that Johnson presents in all of its grandeur on screen, Bigger complains about the complacency he sees around him. Yet he seems almost offended when others suggest he spread his wings to seek something more meaningful than his job as a bike messenger. As Bigger weaves in and out of the towering skyscrapers in downtown Chicago, he stands out. Bigger desperately wants to be thoughtful and radical, but it’s clear from the film’s opening that he’s sleepwalking through life. Though content to spend his days running packages across the city and flirting with his stunning girlfriend, Bessie (If Beale Street Could Talk’s Kiki Layne), a hairstylist and college student, Bigger is forced to confront himself and his position in society when he’s offered a job as a live-in driver with the affluent Dalton family. White, liberal millionaire Henry (Bill Camp), his blind wife (Elizabeth Marvel), and their twentysomething daughter, Mary (Margaret Qualley), welcome Bigger with open arms into their world. However, living with the Daltons on their sweeping estate puts Bigger directly in the intersection of race and class, and in the crosshairs of Mary, an exhaustingly self-absorbed white feminist. It’s a position that threatens to eat him alive. From the moment he begins the job, Mary seems intent on positioning Bigger as her new pet. Though she’s meant to be driven to her evening college classes, Mary and her political activist fiancé, Jan (Nick Robinson), insist that Bigger take them to soul food restaurants in his neighborhood. More nights like this follow. Bigger is lured into a false intimacy with his new employers. Enamored of Bessie, Bigger is also intrigued by Mary’s whiteness, social status, and femininity, so he indulges her monopolization of his time. It comes as a surprise to no one when it all comes to a head on one fateful, ecstasy-filled night. Bigger transforms into the monster society has damned him to become, and instead of making amends for his mistake, he revels in it. From the moment we are introduced to Bigger, his two consciousnesses are at war. Like the W.E.B. Dubois concept suggests, Bigger is trying to grapple with who he is as a black man while wrestling against the stereotypes society has attached to him. In the opening shot of Native Son, the audience is shown Bigger’s well-worn copy of Ralph Ellison’s Invisible Man with a loaded pistol resting on it. It’s a duality that Johnson also uses in his filmmaking—it’s moody but sharp, with the director using muted tones and hyper-lapses to give the audience some sense of Bigger’s state of mind. Book purists might take issue with Parks and Johnson’s two significant departures from Wright’s material. As the novel concludes, Bigger rapes and murders Bessie in a fit of rage, but things don’t unfold that way in the film. A controversial masturbation scene featuring Bigger and one of his friends was also omitted since it added no further context to the film’s alternative ending. It’s arguable that in today’s sociopolitical climate, with the constant depictions of violence against black bodies, and the historical degradation of black women on screen, these were much-needed updates, but they in no one way temper the dark and tormented source material. Native Son is not an easy film to unpack, but matters of race, class, and justice never are. Johnson’s choice to update Wright’s work is what keeps the film afloat, but the narrative does start to crack when the director relies too heavily on the author’s blueprint. The idea of a modern-day estate being fueled by a coal furnace is almost baffling, forcing the audience to stretch their imagination further than should be required. Also, though Bigger is boxed in by the Daltons in many ways, his lack of self-awareness and inability to think critically in a world where black men must always be hyper-alert make him less sympathetic and relatable. It’s true that racism and privilege are still prevalent in our society—however, the way in which we understand these social issues has evolved. A completely updated climax (sans the furnace) would have been a more interesting entry point into Wright’s work. Still, Sanders’ gripping and terrifying performance gives a much-needed vibrancy to this tragic story. Bigger is soft-spoken and thoughtful with a predatory undertone, as if he’s been waiting to unleash the monstrous side from the very beginning. The rest of the ensemble, from Layne—who is even more enchanting here as Bessie than she was in her breakout role in Beale Street—to Lathan, Qualley, David Alan Grier, Jerod Haynes (NBC’s The Village), and Lamar Johnson (The Hate U Give), give the very dark subject matter of Native Son rich texture. Native Son is heartbreaking and painfully relevant, proving that in the nearly 80 years since Wright published his novel, little has changed. Johnson goes for a thoroughly modern update at first, but in the second half of the film, he gets in his own way by holding on to some of Wright’s antiquated plot points, which erase some of the film’s realism. Native Son is profoundly upsetting to watch. Its gruesome scenes, stemming from Wright’s pages, are relentless, Bigger’s arrogance leads to his own demise, and there’s an acknowledgment that America is still stewing and indulging in its own ignorances.